Southern California attracts its fair share of Canadian snowbirds in the winter, especially to the desert communities near Palm Springs, as well as the area around San Diego. The laid back California lifestyle and the proximity of Los Angeles and San Diego - as well as the dramatic mountain ranges and desert scenery - offer many options for keeping active and having lots to see and do. Oh yes, and then there’s the wine! The Southern California area is well served by airports with seasonal non-stop and connecting flights from Vancouver, Calgary and Toronto to Palm Springs, as well as year-round, non-stop and connecting flights into both Los Angeles and San Diego from several Canadian gateways. Of course, many snowbirds will drive down from Western Canada and some make the trek from Ontario as well. The drive is a beautiful one going through some unique landscapes, mountain ranges and desert rock formations, depending on your route. And when the family come to visit, you can all meet at Disneyland or Universal Studios for a few days of guaranteed fun. Many snowbirds also choose to take cruises from either Los Angeles or San Diego while they are wintering in Southern California. Snowbirds seeking a sunny, dry climate won’t find anywhere better than Palm Springs. Famous for attracting Hollywood stars, Palm Springs is a small city about 100 miles east of Los Angeles and north east of San Diego. Surrounded by mountain ranges, the area rarely gets any rainfall. The city honours some of its well-known celebrity visitors of the past by naming streets after them, so you will find yourself driving along streets named after Bob Hope, Frank Sinatra, Kirk Douglas and Gene Autry. There are over 120 golf courses in Palm Springs, making it a golfer’s dream with golfers from around the world coming here. But this is also a great destination for hiking, biking, rock climbing and touring. Downtown Palm Springs has a great Art Deco feel and there are lots of galleries, boutiques, restaurants and bars. For LGBT snowbirds, downtown is definitely LGBT friendly, with a number of LGBT festivals and events held each year. Palm Springs also has its own airport with connections from many points in the U.S. as well as some seasonal service from Canada. Continuing east from Palm Springs in the Coachella Valley, there are a string of small cities, each attracting snowbirds to the desert life every winter. The first cities you’ll come across are Cathedral City and Rancho Mirage, both of which have lots of rental accommodation, planned golf communities and great shopping and restaurants. Palm Desert is adjacent to Rancho Mirage and is one of the top destinations for Canadian snowbirds. Boasting the same dry, sunny weather and lots of affordable accommodations and golf courses, the area’s population grows significantly each winter. In addition to golf, there are many tennis facilities and options for snowbirds who love to hike in the canyons and go cycling. Many snowbirds also take advantage of the many spas in the area and take part in wellness programs. 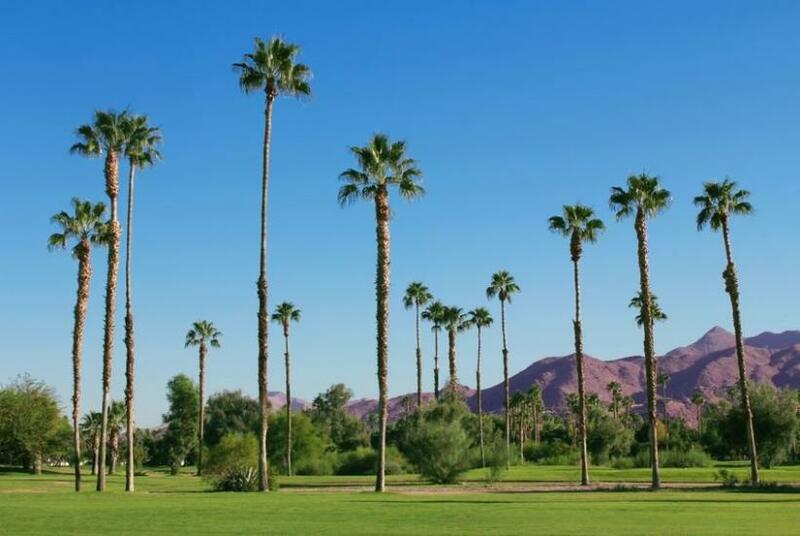 Continuing farther east in the Coachella Valley, you will find more communities that are popular with snowbirds in Indian Wells, La Quinta and Indio. There is a strong Spanish influence in these communities with Native festivals, art and cultural events. Another very affordable place for snowbirds to spend the winter is Desert Hot Springs, a rapidly growing community that sees a lot of winter visitors. Located north of Palm Springs, Desert Hot Springs is a spa destination that actually does have hot mineral springs and award winning water. There are great views of snow-capped Mt. Jacinto, as well as great restaurants and shopping in the area. San Diego is a large city located on the Pacific Ocean just north of the Mexican border. It enjoys a warm, mild climate in the winter and is blessed with many beautiful beaches along the coast. The city offers many things to see and do including the historic downtown, art galleries, museums and many fine restaurants. There’s of course great shopping everywhere and you can cross to Tijuana for some Mexican shopping and dining. Snowbirds also enjoy expansive Balboa Park, where you will find the famous San Diego Zoo. The city has a huge harbour that is home to a U.S. Naval fleet and a naval museum. The port is frequented by cruise ships that travel south to Baja California and the Mexican Pacific coast. San Diego celebrates many festivals during the winter season including Chinese New Year and Mardi Gras. Snowbirds can find varied accommodations in all price ranges, as well as some excellent RV parks, in places like La Jolla, Carlsbad, Chula Vista and Escondido and the surrounding areas.